Clansfolk to erect a memorial cairn at "Baile nam Bàrd"
An important symposium on the history and literary heritage of the MacMhuirich bardic dynasty takes place in South Uist on Saturday 25 August 2012. 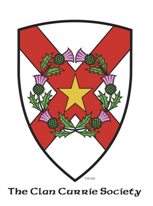 The symposium takes place as part of a weekend of celebrations dedicated to Scotland’s greatest bardic dynasty, the Clan MacMhuirich or Clan Currie. The MacMhuirich symposium, being held at iochdar school in the village of iochdar, will bring a new perspective to the role of the MacMhuirichs in Scottish literary history. The MacMhuirichs, a name later anglicized to ‘Currie’ and in some parts of Scotland as ‘Macpherson’, ‘Murray’ and even ‘MacMillan’, served for over 700 years as professional poets to the Lords of the Isles, and later to the MacDonalds of Clanranald. Members of the public are cordially invited to attend this event. The prestigious programme for the symposium will chaired by the Rev. Dr. David Currie, Chaplain of the Clan Currie Society joined by speakers Dr. Michael Newton of St. Francis Xavier University, Dr Alan Titley of University College Cork, Western Isles Council Archaeologist Deborah Anderson and Uist and Benbecula historian Angus MacMillan. The MacMhuirich Symposium precedes the building and dedication of a memorial cairn (monument) in honor of the MacMhuirich bards of South Uist at Stilligarry. The cairn will include stones submitted by clansfolk from the four corners of the globe representing the clan's far-flung sons and daughters. The MacMhuirich Symposium on 25 August is a date not to be missed, not only for anyone interested in the MacMhuirichs, but also for people interested in the history and literature of Scotland during the medieval period and, in particular the Lords of the Isles. A warm invitation is extended to all events over the weekend of 24 to 26 August, including in addition to the symposium, a welcome reception on Friday evening, and a clan ceilidh on Saturday, August 25 and to the erection and dedication of the MacMhuirich Cairn on Sunday 26 August. For further details and information on how to register for each event visit www.clancurriegathering.com. For more information contact Robert Currie (USA) on 001 908 803 4043 / clancurrie@mail.com or Bryan Macpherson (Scotland) on 01870 602427 / macpherson@nuntonhills.net.